Products in the Condition-Specific Support category are concentrated omega-3s, that deliver high levels of EPA and DHA blended with condition-specific nutrients, for a combined effect that is greater than each nutrient taken individually. These synergistic blends offer patients single-formula convenience, cost savings and improved results. Products in the High-Intensity Support category are concentrated omega-3s, and deliver a minimum of 1100 mg EPA+DHA. While there is slight EPA dominance in these concentrates, both EPA and DHA levels are significant. High-Intensity Support products are intended for patients challenged by heart disease, inflammation, and other chronic conditions, or for those looking for more omegas in a smaller serving. Products in the Maintenance Support category are non-concentrated omega-3s, and deliver at least 500 mg of naturally occurring EPA+DHA per serving, in line with the expert-recommended daily minimum. Maintenance Support products are made from fish oil with EPA/DHA ratios as they occur in nature. They are intended for healthy patients who eat a minimum of two servings of oily, cold water fish per week. Products in the Targeted Support category are concentrated omega-3s and have high levels of either EPA or DHA for patients with targeted health needs. For example, high levels of DHA are indicated to support pregnancy or to help heal traumatic brain injury. 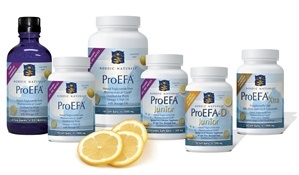 High EPA levels have been shown to reduce elevated triglyceride levels, and offer anti-inflammatory support. The fish oil that started it all... Nordic Naturals offers the only 100% Arctic cod (Skrei) liver oil on the market. No fish body oils or synthetic vitamins or additives are ever used. No other brand can honestly make the same claim. Over the past decade, we have perfected our three-step Gold Standard system that allows Nordic Naturals Arctic Cod Liver Oil to test at 10 times lower than the limits set by the strict Norwegian Medicinal Standard and European Pharmacopoeia Standard for purity and freshness. Products in the Pediatric Support category offer unique delivery options and dosing tailored to children at various stages of growth and development. Made with delicious all-natural fruit flavors, they please even the pickiest palates to help ensure compliance.